We had a bit of a celebration to usher in the new Football season last weekend. Food, Food, family time and more FOOD! We all piled on the sofa for some Giants Football viewing to kick off the new season and we had a blast! 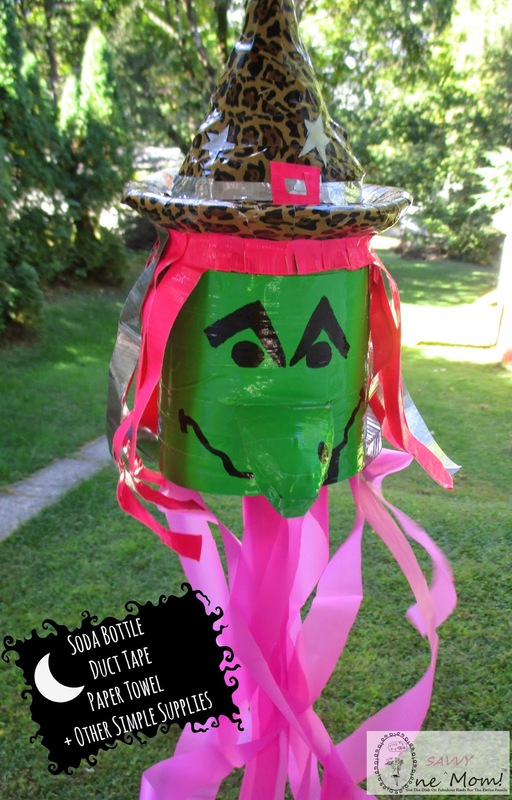 After it was over we had a few empty Pepsi and Dr. Pepper bottles that I decided to upcycle into some cute Halloween craft projects for the kids. 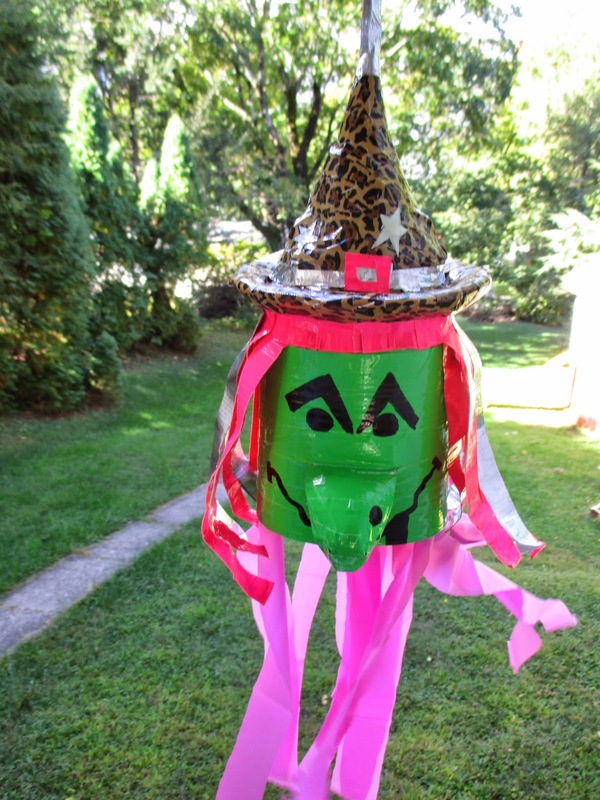 We made this Witch Windsock with an upcycled soda bottle, a Bounty paper towel, Duck Tape and a few other simple supplies (that you most likely already have around the house). 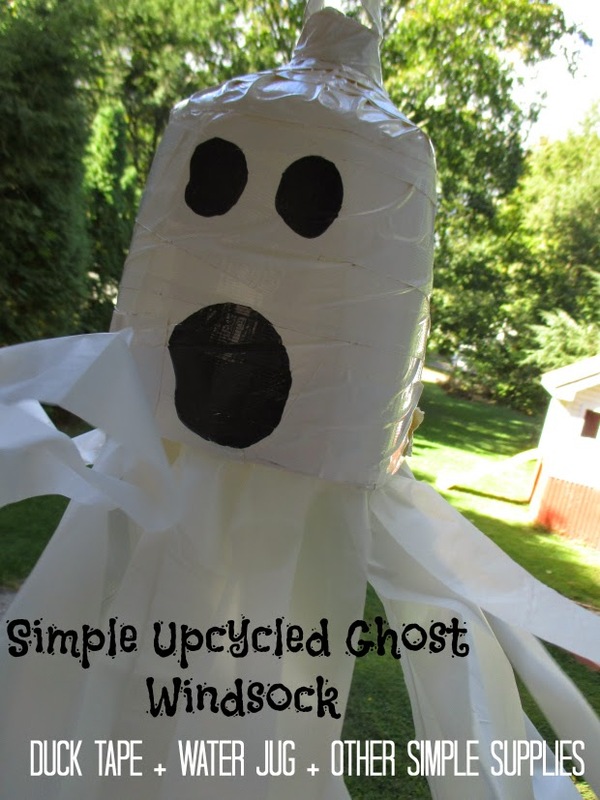 We also made a super simple upcycled ghost windsock (perfect Halloween project for the younger kiddo's). Duck Tape ( we used green, neon pink, leopard, silver and glow-in-the dark Duck Tape Ducklings™ Mini Rolls ). Empty Soda Bottle (cut the bottom of the bottle off + cut one of the points off of the bottom/base of the bottle and affix to the front of the bottle with green Duct Tape to create the nose . 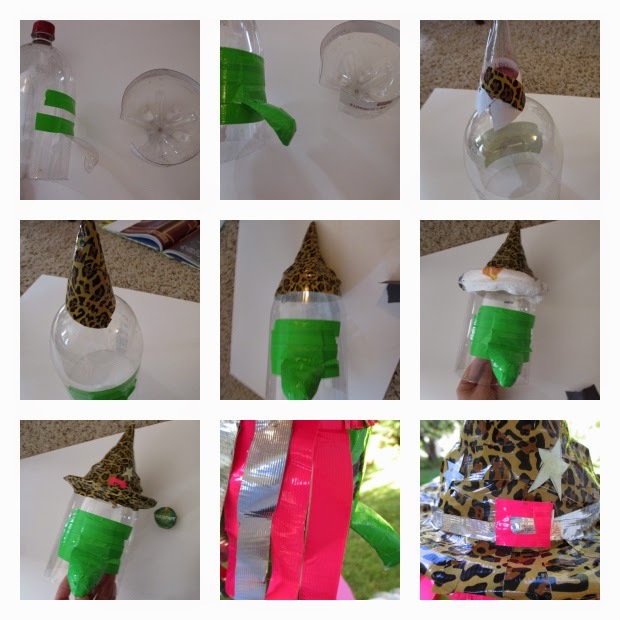 Use the other remaining strip of bottle that you cut off to create a cone for the top of your Witches "hat" - refer to images below. Plastic party table cover (we found ours at Walmart for $1) in your choice of color (we used pink so it looks like a continuation of the Witches "hair". Black Permanent marker to draw the witches face (refer to images above and below). Bounty Paper Towel (roll the paper town and keep in place with three pieces of tape (bottom - middle - and top) then affix to the base of your witches "hat" using duck tape (cover all of the paper towel as pictured - to create the brim for your witches "hat". Cut several 12 inch strips of Duck Tape (we used the Duck Tape Ducklings™ Mini Rolls - in hot pink and silver color choices) and fold almost in half (sticking sticky sides together - leave a small piece of tape at top to affix to the bottle to create your Witches hair). Repeat process for each piece of "hair". Cut your plastic party table cover into 16" L x 1"W strips (about 16 if your using a 2 liter soda bottle - affix to the inside of the bottle using green Duct Tape. White Plastic party table cover ( we found ours for $1 at Walmart) (cut about 16 strips 16" L x 1"W strips - affix each strip to the inside of the container with a small piece of Duck Tape. Create a hanger for your Windsock: Fold over a 6 inch piece of duck tape (in half - concealing the sticky sides completely. Next fold this piece in half - over the top of the bottle after it is completely covered in Duck Tape - and affix with more White Duck Tape to create your hanger (see image below). Happy Crafting & Happy Halloween! *Disclosure: Duck Tape samples were received. All opinions expressed are our own.